Locked-In Syndrome is a straightforward introduction to a complex man, Jean-Dominique Bauby. Bauby, an editor at Elle magazine, suffered a sudden stroke that left him unable to do more than twitch his left eye, and yet his conscious mind remained in perfect working order. Locked-In Syndrome shows us over the course of just 30 minutes how Jean-Do is able to communicate, what his surroundings are, how many people it takes to care for him, and how difficult his physical therapy is (even the part that “only” consists of making faces). Because the documentary is straightforward and not message-driven, it’s easy to bring one’s own ideas and fears. Watching Jean-Do’s life, I thought of health care systems, human resilience, the love and patience of caregivers, the need to express oneself, and the crushing pain of boredom. Someone else could get something completely different. Locked-In Syndrome is an excellent documentary, mostly due to the riveting subject. But give credit to Beineix for playing it so straight and keeping it so concise. Beineix is reporting here, and not sympathizing, and that feels like exactly the right approach. At the same time, Beineix does use some filmmaker’s tricks to convey Jean-Do’s state of mind. He edits scenes to convey life’s little annoyances, like a visitor playing a beeping handheld game, patients playing ping pong, and Jean-Do’s ears taking it all in, unable to stop the noise or express frustration. Beineix shows us steaming trays of food in the cafeteria, then shows us Jean-Do, reminding us that he can smell but not eat. Or a girl plays with a clockwork puppy that barks and flips. Beineix lingers, then escalates, showing us a roomful of flipping puppies, which at first suggests infinite frustration but then becomes a Proustian dream of gears turning and springs unwinding and motion and noise, and all to no effect, like a brain in a vat with endless pent-up energy and no controlled outlet just the frustrating churn of unchecked thought. 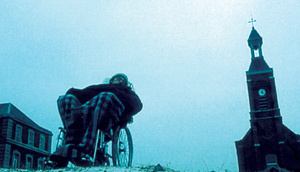 Locked-In Syndrome is an excellent companion piece to The Diving Bell and the Butterfly, which was released ten years later. That film is a feature-length drama about Jean-Do, and it takes us inside his head. It concludes with Jean-Do’s death just weeks after the publication of his book. Locked-In Syndrome was made while he was alive and ends with Bauby still working on his book. I was glad to see the documentary second because even its routine shots in the hallways carried over the emotional power from the feature-length drama. At the root of drama is the mask. The feature film shows us Bauby’s character and makes us empathize with him. But because it’s a drama, it is the character we come to love — the mask and not the man. Locked-In Syndrome shows us the man behind the mask. He’s real; he inhabited our world, and not the world of the movies. The day he goes to the beach is a day that you and I were busy with our own lives on another continent, and we saw the same sun that day. To see that day and to know the man so intimately from his portrayal by an actor ten years later, is a strange and marvelous revelation.